OKLAHOMA CITY – A month after Kevin Durant broke Oklahoma City’s heart, Russell Westbrook has reaffirmed his desire to stay with the Thunder. The team confirmed Thursday that Westbrook signed a contract extension. A person with direct knowledge of the terms said the sides had agreed on a three-year deal worth $85.7 million. The person spoke to The Associated Press on condition of anonymity because the team did not release terms. The 27-year-old Westbrook is one of the top stars in the NBA and piled up 18 triple-doubles last season, tying Magic Johnson for the most in the last 30 years. The five-time All-Star averaged 23.5 points, 7.8 rebounds and 10.4 assists last season as the Thunder reached the Western Conference finals, in which they lost in seven games to the Golden State Warriors after jumping to a 3-1 series lead. For his entire career, Westbrook had been paired with a fellow superstar in Durant and together they turned Oklahoma City into a perennial NBA title contender. The Thunder have reached the conference finals in four of the past six seasons but advanced to the NBA Finals only once, falling to the Miami Heat in 2012. Westbrook’s contract had been set to expire after next season, and after Durant’s departure – which was unexpected by Thunder fans – rumors swirled about Westbrook’s future. If things go poorly for Oklahoma City during the upcoming season, the length of Westbrook’s new contract would seem to make him a more valuable trade piece. For now, he and Thunder seem to be going all in. 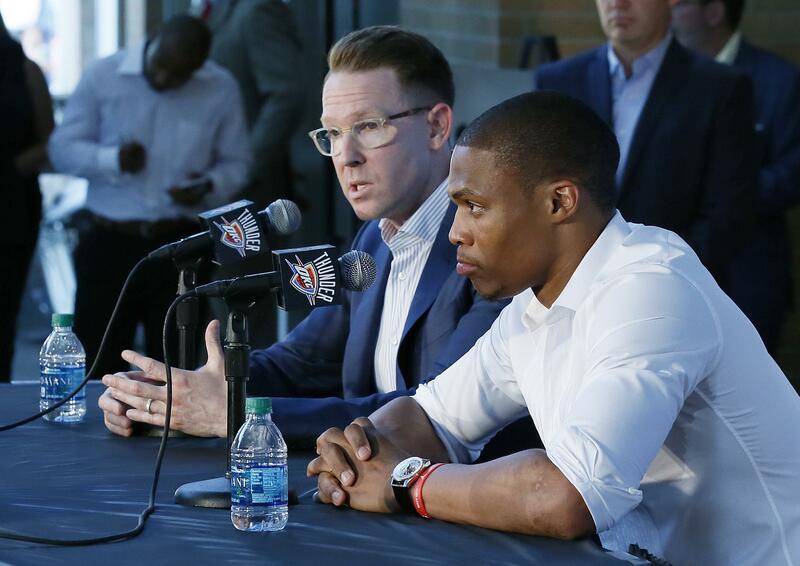 “On behalf of the Thunder organization and the entire state of Oklahoma I want to congratulate Russ and offer my sincere appreciation for not only his profound presence and skill as a player, but for his high character, personal integrity and extraordinary leadership,” team owner Clay Bennett said. In Rio de Janeiro, where he is part of the U.S. men’s Olympic team, Durant said he wouldn’t immediately be reaching out to Westbrook to discuss his decision to stay in Oklahoma City. Even without Durant, the Thunder have talent to go with Westbrook. Steven Adams showed during the playoffs that he rapidly is moving up the ranks of NBA centers, and another post player, Enes Kanter, finished third in voting for the NBA’s Sixth Man of the Year award last season. A draft-night deal with the Orlando Magic, in which the Thunder lost Serge Ibaka, brought in sharpshooting guard Victor Oladipo and Domantas Sabonis – whom the Magic selected with the 11th pick – along with forward Ersan Ilyasova. Point guard Cameron Payne, a 2015 lottery pick entering his second season, was one of the top players in the NBA Summer League in Orlando this year. Published: Aug. 4, 2016, 5:37 p.m.